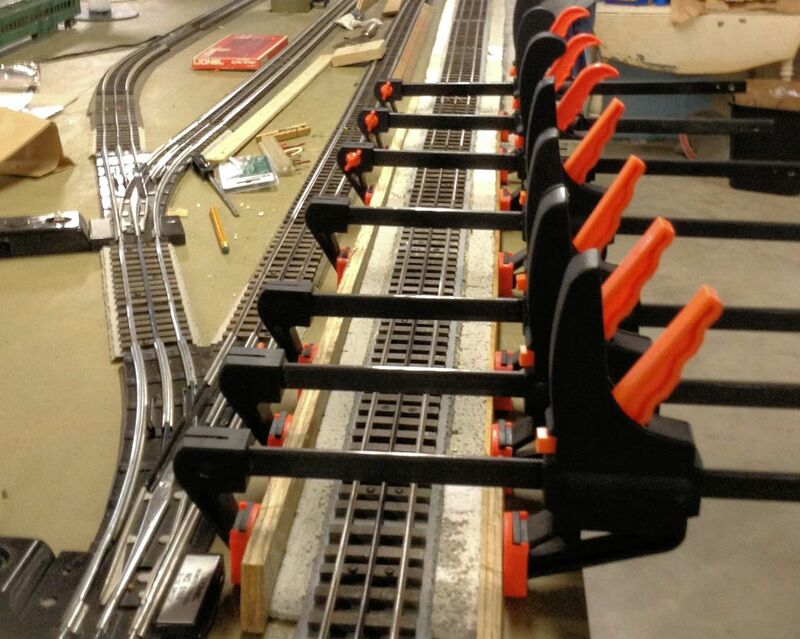 Our round-robin railroad group has been working on large 3-rail “O” gauge layout. It has a long (about 8 feet) grade that climbs to cross over a river bridge. 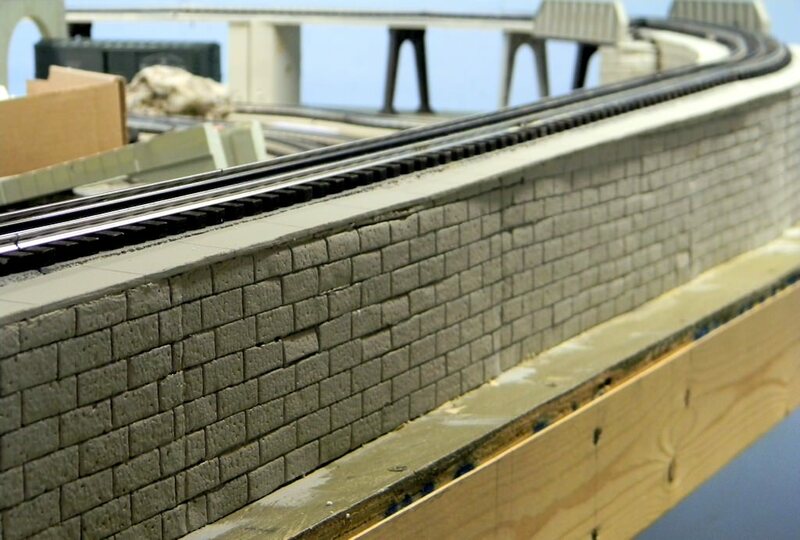 This elevated grade was built using plywood supported by 2’x3′ risers and mostly parallels an edge of the layout – leaving a problem for the scenery along the edge. We decided to build a block retaining wall along this grade. 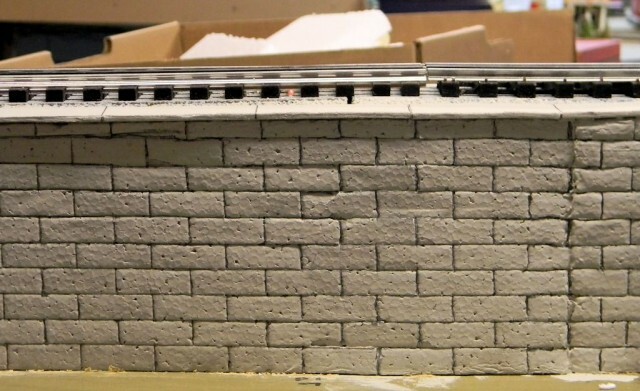 In a previous article, I talked about making background scenery from packaging Styrofoam. At the end of the article, we showed a sample piece of Styrofoam made to simulate a block wall. This could be a solution for the scenery along the side of this elevated track. Ron Gawedzinski took on the challenge and created a much improved wall over that original sample. This was the technique used to build the wall for the elevated track to the bridge crossing. 3/4-inch thick packaging Styrofoam was chosen for the wall material. It was painted several coats of a light gray with exterior latex house paint. The block pattern was created using a Lego block as a pattern. Yes, the same Lego block our kids play with. A number 2 pencil with a sharp point and a ruler were used to sketch the block panel. A putty knife and a 1/2-inch wide wood chisel were used to give a slight indentation to the pencil lines outlining the block pattern. 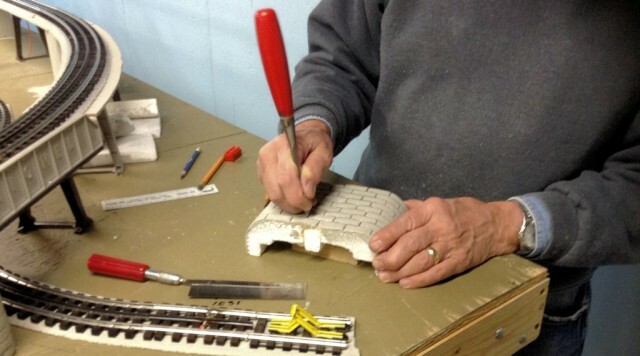 The Styrofoam sheets were then cut to fit the grade and glued to each side of the incline. To finish the top of the walls, 1/2-inch thick wood strips were painted with the same light gray paint used on the Styrofoam and cut into 2-1/2″ long by 3/4″ wide strips. These were glued to the top of the walls to represent cap stones. 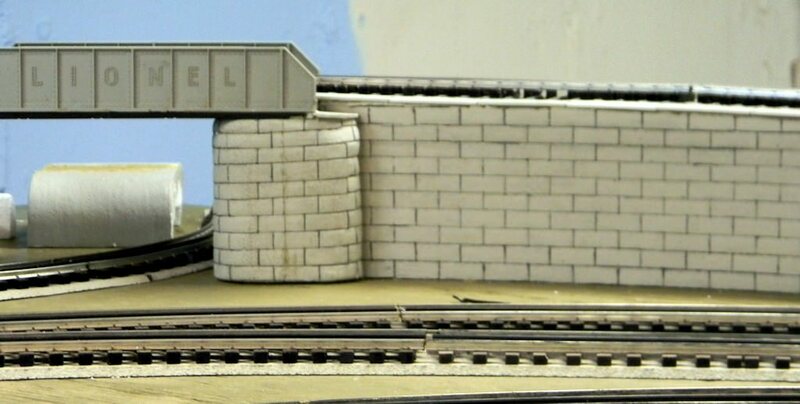 An interesting use of the Styrofoam was the round curved pieces used as bridge supports for crossing over a short spur track that were cut from the round edges of an Omaha Steaks shipping container. This was our solution to our problem of a long grade that was on the edge the layout. Again we were able to make use a material that would have ended up as trash. We would be interested in hearing if anyone else would find this material as a way to solve their scenery problems.